St. John Valley Technology Center offers Maine high school students modern, hands-on training in technical programs including Automotive, Building Trades and more. 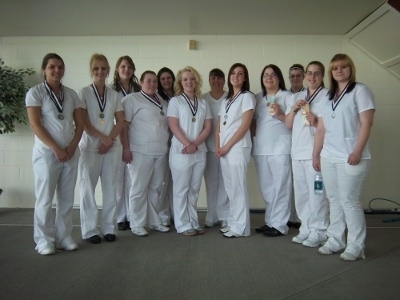 Mrs. Marie May Chasse’s Health Occupation students from the St. John Valley Technology Center won 25 medals at the 37th Annual Maine State Health Occupation Students of America (HOSA) competition on April 5, 2013. All year the students worked on community service projects and have done several fund raising events to pay for the costs related with this competition, thanks to all our supporters. The St. John Valley was well represented by mature and hard working young ladies. Sierra Burress & Nicole Gendreau (MHS) won Gold Medals in the CPR & First Aid team competition, Casey Tardif & Keianna Sirois (CHS) won Silver Medals, and Julie Dumond & Morgan Dumond won Bronze medals in the CPR & First Aid team competitions. Casey Tardif won a Gold medal in the Physical Therapy Assisting competition. Keianna Sirois won a Gold medal in Medical Terminology. Sierra Burress & Nicole Gendreau (MHS) won a Silver Medal for the Career Health Display. Morgan Dumond (WHS) won a Silver medal in the Job Seeking Skills event. Julie Dumond (WHS) won a Bronze medal in the Nursing Assistant competition. Indya Ouellette (MHS) won a Gold Medal in the Nursing Assistant Competition, and a Silver Medal in the Physical Therapy Assisting Competition. Brittney Beaulieu (MHS) won a Gold medal in Job Seeking Skills, a Bronze medal in Medical Terminology, and a Bronze medal in Home Health Aide. Amber Ouellette (MHS) won a Silver Medal in Medical Terminology and a Bronze Medal in Home Health Aide. Cassidy Ouellette (CHS) won a Silver Medal in Nursing Assistant, a Silver medal in Home Health Aide, and a Silver medal in Job Seeking Skills events. Morgan Dubois (CHS) won a Gold medal in Job Seeking Skills, a Gold medal in Home Health Aide, and a Bronze Medal in Physical Therapy Assisting. Picture Left to right: Cassidy Ouellette (CHS), Morgan Dubois (CHS), Casey Tardif (WHS), Sierra Burress (MHS), Nicole Gendreau (MHS), Indya Ouellette (MHS),Mrs. Marie May Chasse RN, Morgan Dumond (WHS), Julie Dumond (WHS), Keianna Sirois (CHS), Brittney Beaulieu (MHS), and Amber Ouellette (MHS).